I have accepted my fate as an oily skin individual. The urban myths tell me I will age well, and while that would be great if I was entering my golden years of retirement, I have to accept my current plight of being a young professional woman in my 30's who is trying to fight the shine. Not of my hair, my career, or my jewels - but of my face. And summers in NYC only exist to be the bane of my facial existence. You can imagine my surprise when a few years ago, I was introduced to cleansing OILS that I could use to clean my face and take off makeup. Say wha? Oil on my face? Hell to the n.....well OK, I'll try it. Sucker. Which is how I felt until I used my first Shu Uemura cleansing oil - and it was quite remarkable. It cut right through my makeup (a feat in and of itself), and rinsed off with amazing ease, leaving my skin feeling softer than I thought possible. Convinced this cleansing experience was a fluke, I kept using the oil all week and my skin looked brighter, clearer and dare I say slightly less oily. Well my bold experiment years ago has turned into a transformation just shy of devotion. While I do dabble in other cleansing mediums - I am never too far away from an oil. My best advice is to use with dry hands and a dry face. A funky feeling is an understatement as you are rubbing oil all over your dry face, but a thorough rinse with water will turn most oils to a milk and wash right away. Caveat emptor (honors Latin ya'll) - if you love that tight, super squeaky clean feeling that many cleansers give - this may not be your gig. But I dare you to shake up your skincare routine and throw in a cleansing oil. You may be on the edge of a beauty breakthrough - a revolution for your face! Nah - probably not - but at least it may give you an excuse to shop - like you really need one. And hell, if you do try - let a girl know! Drop me a line and tell me your thoughts - inquiring minds, ok mind, wants to know. Love your writing.....it is so professional!!!! So great to meet a fellow oily skinned girl in her 30s! Do you recommend a certain cleansing oil? I have to try this. Shu Uemura cleansing oils are my holy grail. A must try. 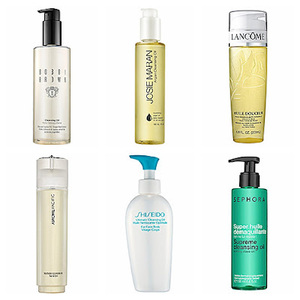 Recently I purchased the Sephora cleansing oil above and it is really great - and much more affordable. But if you can do the splurge - get Shu Uemura to start - the green bottle.